© Gadsden and Long; Licensee Bentham Open. Liposome bupivacaine is a prolonged-release bupivacaine formulation indicated for single-dose administration into the surgical site to produce postsurgical analgesia. An overview of time to onset of analgesia observed with liposome bupivacaine in human studies is provided, as well as a summary of data from pharmacokinetic studies including those that assessed pharmacokinetics after separate versus coadministration of liposome bupivacaine and bupivacaine HCl. Data from multiple studies show that local administration of liposome bupivacaine is associated with rapid onset and effective analgesia after surgery. However, the efficacy profile observed in controlled settings may not replicate the profile observed in clinical practice; time to onset may be impacted by nonpharmacologic factors, such as amount of drug given, location and relative vascularity, and variances in surgical techniques. Some clinicians coadminister or admix bupivacaine HCl and liposome bupivacaine based on the supposition that adjuvant use will result in more rapid onset of efficacy. To date, no clinical studies have been conducted comparing pain-related outcomes following coadministration versus liposome bupivacaine alone. Preclinical pharmacokinetic studies have assessed the potential impact of combined use, which resulted in predictable, additive systemic exposure without compromising the prolonged-release profile of liposome bupivacaine, and without signs of toxicity. Based on available data and approved package insert, in the setting of wound infiltration, clinicians have the flexibility to administer liposome bupivacaine alone, coadminister separately with bupivacaine HCl, or admix with bupivacaine HCl prior to injection, providing the bupivacaine HCl dose does not exceed 50% of the liposome bupivacaine dose. Keywords: Analgesia postsurgical, Bupivacaine HCl, Clinical efficacy, Infiltration, Liposome bupivacaine, Pharmacokinetics. The combined use of multiple analgesic modalities including systemically administered opioids, nonsteroidal anti-inflammatory drugs and acetaminophen, and locally or regionally administered local anesthetics is considered the optimum method for achieving postsurgical pain control . One of the biggest limitations to use of traditional local anesthetic formulations for postsurgical analgesia is the short duration of analgesic activity (no longer than 24 hours) observed with these agents when administered as a single injection [2-4]. Liposome bupivacaine (EXPAREL®; bupivacaine liposome injectable suspension, Pacira Pharmaceuticals, Inc., Parsippany, NJ, USA) is a novel prolonged-release bupivacaine formulation indicated for single-dose administration into the surgical site to produce postsurgical analgesia . It is also being evaluated for peripheral nerve block, which is currently an off-label use for this agent [6-8]. Liposome bupivacaine contains approximately 3% extraliposomal bupivacaine, which may contribute to its fast onset of analgesia . Data from multiple studies that have included healthy volunteers as well as surgical patients have shown the time to onset of analgesia following administration of liposome bupivacaine and bupivacaine HCl to be similar , and that liposome bupivacaine given at dosages ≤266 mg provides good analgesic efficacy after surgery [11, 12] in these controlled settings. Nevertheless, as adoption of liposome bupivacaine use has become more widespread, questions have been raised regarding potential differences in the time to onset of clinical efficacy observed with use of liposome bupivacaine in everyday clinical practice compared with time to onset observed in controlled study settings. Put another way, there are questions regarding whether the sustained-release properties that characterize liposome encapsulated bupivacaine may prevent sufficient immediate release and therefore a prompt clinical analgesic effect. This paper provides an overview of time to onset of analgesia observed with liposome bupivacaine in human studies and summarizes data from pharmacokinetic (PK) studies, including those that assessed PK following separate versus coadministration of liposome bupivacaine and bupivacaine HCl. Data from a study conducted by Apseloff et al. showed time to onset of analgesia with liposome bupivacaine and bupivacaine HCl to be similar. In this Phase 1, randomized, sequential-cohort, crossover study, the investigators assessed analgesia in healthy adult volunteers who received local infiltration with liposome bupivacaine 40 mg, bupivacaine HCl 7.5 mg, or placebo (normal saline), each administered in a total volume of 3 mL prior to inducement of pain. The milligram dose of liposome bupivacaine is expressed as the free base (13.3 mg of bupivacaine base is chemically equivalent to 15 mg of bupivacaine HCl) . Subjects were sequentially assigned to 1 of 4 cohorts. In Cohort 1, pain stimuli were administered and pain assessments were performed 30 minutes after study drug administration; pain stimuli and assessments occurred at 15 minutes after study drug in Cohort 2, at 5 minutes after study drug in Cohort 3, and at 2 minutes after study drug in Cohort 4. Subjects in each cohort received 1 of the 2 active study drugs and placebo infiltrated into a 3 cm x 3 cm square area on the volar surface of the forearm. The experimental painful stimuli involved creation of a uniform, reproducible skin incision followed by topical application of an 18% acetic acid solution to enhance pain. Pain intensity was assessed using a 100 mm visual analog scale (0=no pain, 100=worst possible pain) at 2, 5, 15, and 30 minutes after study drug administration. Statistical comparisons were made to test for differences in mean visual analog scale scores between liposome bupivacaine and placebo, and between bupivacaine HCl and placebo . At total of 132 subjects received at least 1 dose of liposome bupivacaine or bupivacaine HCl; 32 in Cohort 1, 32 in Cohort 2, 34 in Cohort 3, and 34 in Cohort 4. At 2 minutes post-dose, mean (standard deviation [SD]) pain intensity scores were 26% lower with liposome bupivacaine versus placebo (47  vs. 61 ; p<0.0001); mean [SD] scores were 32% lower with bupivacaine HCl versus placebo (38  vs. 61 ; p<0.0001). A greater than 30% reduction in mean pain scores was also observed for both liposome bupivacaine and bupivacaine HCl compared with saline placebo at 5, 15, and 30 minutes after study drug administration, which was significant versus placebo at all 3 time points (p<0.0001) . Dasta et al. analyzed pooled efficacy and safety data from Phase 2 and 3 studies conducted during clinical development of liposome bupivacaine. These studies assessed analgesic regimens incorporating a single surgical site administration of liposome bupivacaine versus bupivacaine HCl or placebo for postsurgical analgesia in adults undergoing inguinal hernia repair, total knee arthroplasty, hemorrhoidectomy, or breast augmentation. The investigators reported that subjects receiving US Food and Drug Administration (FDA)-approved doses of liposome bupivacaine (≤266 mg) had significantly lower cumulative pain scores during the first 72 hours after surgery compared with subjects receiving bupivacaine HCl (283 vs. 329; p=0.039), as well as a longer time to first use of opioids after surgery (9.9 hours vs. 2.7 hours; p<0.0001), a lower total amount of postsurgical opioid consumption (12 mg vs. 19 mg; p<0.0001), and a lower incidence of opioid-related adverse events (20% vs. 36%; p<0.0001) . Mean pain intensity scores at the first timed pain intensity assessment in each of the active-controlled studies reported by Dasta et al. are summarized in Table 1 (Unpublished data). In most experimental conditions across studies (76%; n=13/17 assessments), liposome bupivacaine was associated with better analgesia than bupivacaine HCl, as reflected in lower mean pain intensity scores recorded at the first postsurgical assessment. Note that liposome bupivacaine was largely superior for assessments performed at 1 hour, but the difference was not overwhelming (n=5/8 assessments or 63%); in contrast, by 4 hours, liposome bupivacaine was superior to bupivacaine HCl in every instance (n=4/4 assessments). Analgesic efficacy of liposome bupivacaine versus bupivacaine HCl in different surgical models at the first postsurgical pain assessment (Unpublished data). Although the study data described above demonstrate the efficacy of liposome bupivacaine for rapid-onset analgesia, the analgesic efficacy profile observed in everyday clinical practice may not replicate the profile observed in controlled experimental settings. The analgesic profile of local anesthetics is primarily determined by the inherent pharmacological properties of each individual agent . However, time to onset of clinical efficacy may also be impacted by nonpharmacologic factors, such as administration route (e.g., epidural administration vs. use in peripheral nerve block), amount of drug given, anatomical location and the relative vascularity of the surgical site (relatively vascular surgical site [e.g., hemorrhoidectomy] vs. relatively avascular surgical site [e.g., bunionectomy]) . The PK profile of liposome bupivacaine following single-dose administration in humans has been well established, based on PK data from 4 randomized, double-blind clinical studies conducted in surgical patients . PK analyses included 253 subjects who underwent inguinal hernia repair (n=76), total knee arthroplasty (n=126), hemorrhoidectomy (n=25), or bunionectomy (n=26) and received liposome bupivacaine dosages ranging from 106 mg to 532 mg or bupivacaine HCl at dosages of 100 or 150 mg. In these studies, liposome bupivacaine was shown to exhibit a dose-proportional, bimodal release profile across the range of dosages tested . The small amount of extraliposomal bupivacaine contained in liposome bupivacaine results in an initial peak plasma bupivacaine concentration within 1 hour after administration of liposome bupivacaine. The remainder of bupivacaine is encapsulated in multivesicular liposomes, allowing for prolonged release resulting in a second plasma concentration peak that occurs about 12 to 36 hours after the initial peak (Fig. 1) (Unpublished data). PK parameters for each dose level of liposome bupivacaine and bupivacaine HCl tested across the 4 clinical studies are summarized in Table 2 . 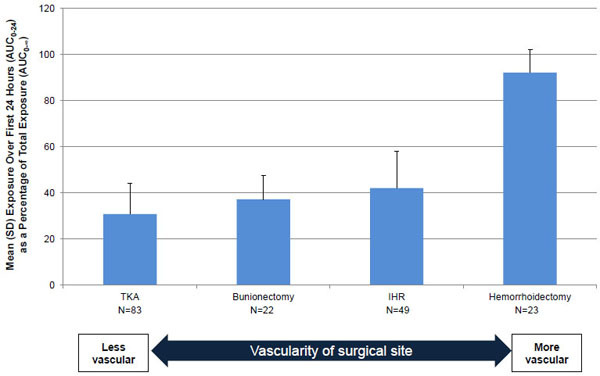 These data suggest bupivacaine exposure following administration of liposome bupivacaine appears to be affected by the vascularity of the surgical site, since the median time to peak bupivacaine plasma concentration (Tmax) occurred earlier in surgery conducted in a highly vascularized area (i.e., hemorrhoidectomy; 0.5 hours) compared with surgery conducted in a relatively avascular area (i.e., total knee arthroplasty; 12-36 hours). This observation is further supported by data from an analysis of bupivacaine exposure during the first 24 hours after administration of liposome bupivacaine in different surgical models (Unpublished data). Bupivacaine exposure, as reflected in mean area under the plasma concentration curve (AUC) data from 0-24 hours as a percentage of total exposure (AUC from time zero to infinity), shows that the release rate of bupivacaine from the liposomes during the first 24 hours appears to vary depending on the vascularity of the surgical site (Fig. 2) (Unpublished data). More bupivacaine was released from the liposomes during the early post-dose period in the surgery involving a highly vascularized area (hemorrhoidectomy), compared with a surgery conducted in a relatively avascular area (total knee arthroplasty). Summary of pharmacokinetic parameters following single doses of liposome bupivacaine and bupivacaine HCl. * Reprinted with kind permission from Springer Science and Business Media, Springer, and Springer International Publishing Switzerland, Clinical Drug Investigation, Volume 33, 2013, Page 112, Pharmacokinetic profile of liposome bupivacaine injection following a single administration at the surgical site, DeeDee Hu, Erol Onel, Neil Singla, William G. Kramer, Admir Hadzic, Table II, © Springer International Publishing Switzerland 2012 a. Some clinicians prefer to coadminister bupivacaine HCl with liposome bupivacaine based on a desire to attain an accelerated onset of clinical efficacy, while maintaining the prolonged duration of analgesic efficacy associated with liposome bupivacaine . Recognizing that coadministration of bupivacaine HCl and liposome bupivacaine has an additive effect on overall bupivacaine exposure, clinicians should be aware that bupivacaine HCl may be administered immediately prior to liposome bupivacaine as long as the dose of bupivacaine HCl does not exceed 50% of the liposome bupivacaine dose being used . For example, in a case where 266 mg of liposome bupivacaine is being administered to provide postsurgical analgesia for a patient undergoing total knee arthroplasty, bupivacaine HCl may also be administered immediately prior to administration of liposome bupivacaine as long as the dose of bupivacaine HCl does not exceed 133 mg (i.e., 50% of the liposome bupivacaine dose). Plasma bupivacaine concentration versus time following infiltration of liposome bupivacaine 266 mg in the setting of total knee arthroplasty (Unpublished data). Bupivacaine exposure during the first 24 hours after administration (AUC0-24) as a percentage of total exposure (AUC0-∞) (Unpublished data). AUC0-24 = area under the concentration time curve from time zero to 24 hours post-dose; AUC0-∞ = area under the concentration time curve from time zero to infinity; IHR = inguinal hernia repair; SD = standard deviation; TKA = total knee arthroplasty. While coadministration of bupivacaine HCl and liposome bupivacaine has not been formally studied in humans, data from the 2 animal studies summarized below suggest combined use results in additive PK exposure and does not have an adverse effect on the prolonged-release profile of liposome bupivacaine. Both studies were conducted in accordance with FDA Good Laboratory Practices (Unpublished data). The first was a preclinical study conducted in animals to evaluate the potential for PK interactions between liposome bupivacaine and bupivacaine HCl when mixed together prior to administration or given separately with a short delay between administration of each drug (Unpublished data). In this study, male Yucatan miniature swine (N=36) were randomized to 12 groups of 3 animals per group. Each group received subcutaneously administered liposome bupivacaine alone, bupivacaine HCl alone, bupivacaine HCl followed by liposome bupivacaine at 1, 5, or 15 minutes after the bupivacaine HCl dose, or bupivacaine HCl and liposome bupivacaine admixed (Table 3) (Unpublished data). Study drug was administered as 6 serial bolus injections, equally distributed along a 5 cm linear area behind the right ear of each animal. Blood samples for PK analysis were collected pre-dose, at 5, 10, 15, 30 minutes, and 1, 2, 4, 6, 8, 12, 24, 48, 72, and 96 hours post-dose. Pharmacokinetic parameters* for liposome bupivacaine and bupivacaine HCl after subcutaneous administration in minipigs by treatment group (Unpublished data). Bupivacaine exposure was approximately proportional to the administered doses of liposome bupivacaine (2 mg/kg and 4 mg/kg) and bupivacaine HCl (1 mg/kg and 2 mg/kg) given alone, as reflected in maximum plasma concentration (Cmax) and total systemic exposure (AUC from time zero to infinity [AUC0-∞]) data for Groups 1 through 4 shown in Table 3 (Unpublished data). For example, a 4 mg/kg dose of liposome bupivacaine resulted in systemic exposure (AUC0-∞) that was approximately 1.3 times higher than exposure following a 2 mg/kg dose. For bupivacaine HCl, total systemic exposure following a 2 mg/kg dose was approximately 1.2 times greater than with a 1 mg/kg dose. Coadministration of the 2 study drugs separated by 1, 5, or 15 minutes resulted in a mean systemic bupivacaine exposure that was similar to the mean sum of the systemic exposure observed when either study drug was given alone. Similarly, the mean systemic exposure following administration of the 2 study drugs when admixed (mean AUC0-∞ = 5380 h•ng/mL following 2 mg/mL of each study drug admixed) was comparable to the sum of systemic exposures when the study drugs were administered alone (mean AUC0-∞ of 2820 and 3230 h•ng/mL, respectively, following 2 mg/mL of each study drug given alone). Also, the observed time at which Cmax occurred (Tmax) was not affected by coadministration or admixing of the 2 study drugs. 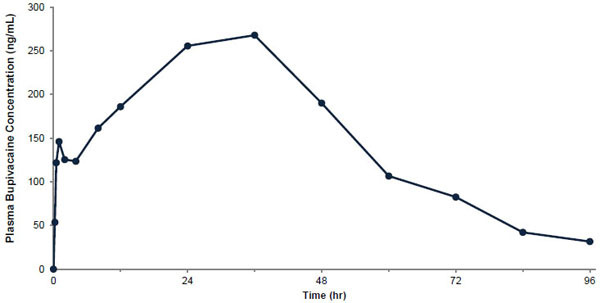 Plasma bupivacaine concentration versus time curves through 8 hours post-dose following administration of 2 or 4 mg/kg of liposome bupivacaine and 1 or 2 mg/kg of bupivacaine HCl given alone were qualitatively similar; the highest mean plasma concentration following administration of liposome bupivacaine 2 mg/kg was about 20% of the highest concentration following administration of the same dose of bupivacaine HCl Fig. (3A) (Unpublished data). 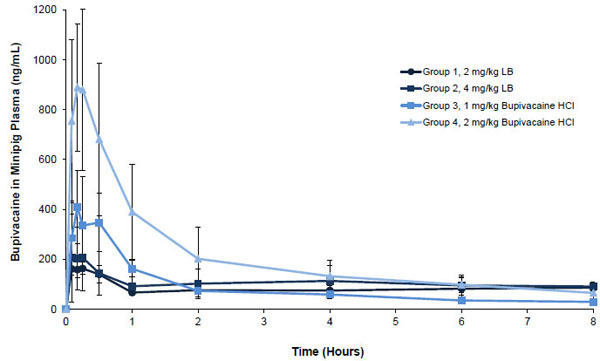 Concentration versus time curves through 8 hours post-dose following coadministration and admixing of 2 mg/kg doses of each study drug are shown in Fig. (3B) (Unpublished data). The highest mean concentration was observed when liposome bupivacaine administration followed bupivacaine HCl by 5 minutes. The shape of the plasma concentration versus time curve following administration of the admixed study drugs was similar to other curves shown in this figure, as well as the curves shown in Fig. (3A). Mean (SD) plasma bupivacaine concentration through 8 hours after subcutaneous doses of liposome bupivacaine alone or bupivacaine HCl alone in minipigs (Unpublished data). LB = liposome bupivacaine; SD = standard deviation. Mean (SD) plasma bupivacaine concentration through 8 hours after equal mg/kg subcutaneous doses of liposome bupivacaine 2 mg/kg and bupivacaine HCl 2 mg/kg coadministered in close proximity to each other or admixed prior to administration in minipigs (Unpublished data). LB = liposome bupivacaine; SD = standard deviation. All doses of liposome bupivacaine given with or without bupivacaine HCl were well tolerated. No clinically meaningful effects of liposome bupivacaine on safety were observed even when the 2 formulations were given in close physical and temporal proximity. In summary, systemic exposure to bupivacaine was approximately proportional to dose for the doses of study drug that were tested and the prolonged-release profile of liposome bupivacaine was not compromised by the presence of bupivacaine HCl, with no adverse safety signals observed during the study. The effects of admixing bupivacaine HCl and liposome bupivacaine were also evaluated in an animal study, which assessed PK following subcutaneous administration of admixed liposome bupivacaine 5.8 mg and bupivacaine HCl 1.3 mg (n=5) compared with the PK profile observed following administration of liposome bupivacaine 6.7 mg (n=4) or bupivacaine HCl 2.5 mg given alone (n=5) in Sprague Dawley rats (Unpublished data). Free and encapsulated bupivacaine in the syringe containing the admixed drugs were also measured. As illustrated by the plasma bupivacaine concentration versus time profiles shown in Fig. 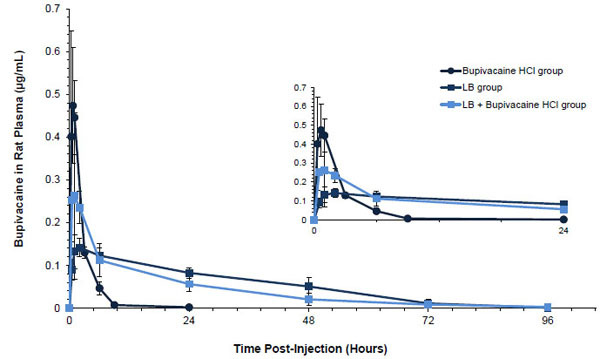 (4) (Unpublished data), the prolonged-release profile of liposome bupivacaine was not compromised when liposome bupivacaine was combined with bupivacaine HCl in the same syringe. Also, more than 90% of the bupivacaine in liposome bupivacaine remained encapsulated in the syringe when the study drugs were admixed—an expected result since the bupivacaine HCl dose used in the admixture was <50% of the liposome bupivacaine dose used . Overall, the results in this study were consistent with results observed in the minipig study—the PK following administration of the admixed study drugs reflected an additive systemic exposure to bupivacaine when compared with each component given alone, and admixture did not compromise the prolonged-release properties of liposome bupivacaine. Mean (SD) plasma bupivacaine concentration versus time in rats (Unpublished data). LB = liposome bupivacaine; SD = standard deviation. The available scientific evidence suggests that single-dose administration of liposome bupivacaine into surgical sites is associated with a rapid onset of analgesia. The Apseloff et al. comparison of time to onset of analgesia associated with bupivacaine HCl and liposome bupivacaine in healthy adults showed analgesia to occur as early as 2 minutes following administration of each formulation with similar analgesic efficacy at that time point. Results from our analysis that compared analgesic efficacy with liposome bupivacaine versus bupivacaine HCl during the first hours after surgery in patients undergoing various types of surgical procedures suggests that, overall, liposome bupivacaine provided better analgesic efficacy than bupivacaine HCl at the earliest timed assessments after surgery, as reflected in lower patient-reported pain intensity scores documented at time points varying from 1 hour to 1 day after surgery. While the available evidence suggests time to onset of analgesia with liposome bupivacaine is similar to bupivacaine HCl, we recognize that adjuvant use of bupivacaine HCl with liposome bupivacaine has been reported , and that adjuvant use of both formulations may be perceived to result in a more rapid onset of clinical efficacy than when liposome bupivacaine is used alone. To our knowledge, there is no scientific evidence to support this perception. Clinical studies assessing the safety and efficacy of coadministration and/or admixture of these 2 bupivacaine formulations prior to administration are warranted. Thus far, the only data currently available regarding combined use come from animal studies. 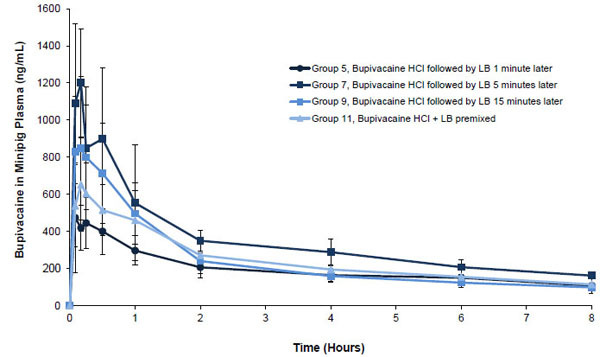 These studies showed that adjuvant use of bupivacaine HCl and liposome bupivacaine, whether they are concomitantly administered but separate in the same surgical site or admixed prior to administration, resulted in a predictable PK with additive exposure to bupivacaine, no disruption in the prolonged-release profile of liposome bupivacaine, and no safety issues observed in the animal models studied. The animal studies demonstrated that the release profile of liposome bupivacaine is unaltered when it is used with bupivacaine HCl. Recognizing the inherent caveats associated with interpretation of results from animal studies, the PK data showing additive (but not synergistic) bupivacaine exposure in animals may help provide perspective on potential safety implications for combined use in humans. The highest mean plasma bupivacaine concentration (Cmax) observed in published human wound infiltration studies of liposome bupivacaine was 935 ng/mL following administration of 532 mg, a dose that is twice the maximum FDA-approved dosage. The highest mean Cmax following administration of bupivacaine HCl in these same studies was 336 ng/mL, which occurred following a 100 mg dose of bupivacaine HCl . Assuming that combined use of the 2 formulations would result in additive bupivacaine exposure in humans as in animals, the sum of the Cmax values observed in humans (≈1,300 ng/mL) would be expected to remain well below the threshold level (≈2,000 ng/mL) at which signs of central nervous system and cardiovascular toxicity begin to occur [15, 16]. PK data from these clinical studies show plasma concentrations reach an initial peak within 1 hour after administration of liposome bupivacaine, followed by a second peak occurring within 36 hours after administration . The results from our analysis of the available PK data in humans suggest that timing of bupivacaine exposure within the first few postoperative days may vary depending on the surgical area where liposome bupivacaine is administered. A greater proportion of systemic exposure tends to occur during the early (first 24 hours) versus late postsurgical period (>24 hours) when liposome bupivacaine is administered into highly vascularized surgical sites (e.g., in hemorrhoidectomy); a greater proportion of exposure tends to occur during the late postsurgical period (>24 hours) when liposome bupivacaine is administered into relatively avascular sites (e.g., in total knee arthroplasty). The data reported here show admixture of liposome bupivacaine and bupivacaine HCl prior to administration appears to be well tolerated as long as the ratio of milligram dose of bupivacaine HCl to liposome bupivacaine dose remains ≤50% as recommended in the liposome bupivacaine package labeling. Data from preclinical studies show that the prolonged-release properties of liposome bupivacaine may be compromised if the ratio of bupivacaine HCl to liposome bupivacaine exceeds 50% . The authors recognize that the currently available liposome bupivacaine data are incomplete, and that extrapolation of observations from controlled study settings to real-world practice has obvious limitations and can provide a potentially imprecise picture of the expected clinical profile of a novel formulation such as liposome bupivacaine. Most controlled pharmacologic studies are designed and conducted long before the experimental drug is available to clinicians, and all data from these studies are derived from experimental conditions that involve relatively small study populations, highly controlled conditions with strict adherence to study protocols, and use of the experimental agent in a limited number of situations. Despite these limitations, the available data suggest combined use of bupivacaine HCl with liposome bupivacaine is an option for clinicians who prefer to do so. Liposome bupivacaine has been shown to exhibit a rapid onset of analgesic effect, as well as a prolonged duration of action for a variety of pain models. Regardless of whether or not there is a perceived “analgesic gap” following administration of liposome bupivacaine, based on the available data and the approved package insert, in the setting of wound infiltration, clinicians have the flexibility to administer liposome bupivacaine alone, coadminister separately with bupivacaine HCl, or admix with bupivacaine HCl prior to injection, as long as the dose of bupivacaine HCl administered does not exceed 50% of the liposome bupivacaine dose used. As with the use of any local anesthetic, the authors recommend proper discretion, careful monitoring, and appropriate reporting of any observed adverse events associated with the use of liposome bupivacaine. Jeffrey Gadsden, MD: Dr. Gadsden has received honoraria as a consultant for Pacira Pharmaceuticals, Inc.
William J. Long, MD: Dr. Long has received compensation from Pacira Pharmaceuticals, Inc., Biomet, Inc., Zimmer, Inc., and Ortho Development Corporation. Editorial assistance was provided by Michael D. Morren, RPh, MBA, of Peloton Advantage, LLC, supported by Pacira Pharmaceuticals, Inc. The authors were fully responsible for the content, editorial decisions, and opinions expressed in the current article. The authors did not receive an honorarium related to the development of this manuscript. Source of Funding: The preclinical animal studies were supported by Pacira Pharmaceuticals, Inc.
 American Society of Anesthesiologists Task Force on Acute Pain Management. Practice guidelines for acute pain management in the perioperative setting: an updated report by the American Society of Anesthesiologists Task Force on Acute Pain Management. Anesthesiology 2012; 116(2): 248-73. Covino BG, Wildsmith JA. Clinical pharmacology of local anesthetic agents. In: Cousins MJ, Bridenbaugh PO, Eds. Neural Blockade in Clinical Anesthesia and Management of Pain. 3rd ed. Philadelphia, PA: Lippincott-Raven 1998; pp. 97-128. Paul JE, Arya A, Hurlburt L, et al. Femoral nerve block improves analgesia outcomes after total knee arthroplasty: a meta-analysis of randomized controlled trials. Anesthesiology 2010; 113(5): 1144-62. Ilfeld BM. Continuous peripheral nerve blocks: a review of the published evidence. Anesth Analg 2011; 113(4): 904-25. Ilfeld BM, Malhotra N, Furnish TJ, Donohue MC, Madison SJ. Liposomal bupivacaine as a single-injection peripheral nerve block: a dose-response study. Anesth Analg 2013; 117(5): 1248-56. Ilfeld BM. Liposome bupivacaine in peripheral nerve blocks and epidural injections to manage postoperative pain. Expert Opin Pharmacother 2013; 14(17): 2421-31. US National Institutes of Health. Femoral nerve block with liposome bupivacaine for postsurgical analgesia following total knee arthroplasty. NCT01683071. Available from: http://clinicaltrials.gov/ct2/show/NCT01683071?term=NCT01683071%5C&rank=1 [Accessed 2014 Oct 17]. Hu D, Onel E, Singla N, Kramer WG, Hadzic A. Pharmacokinetic profile of liposome bupivacaine injection following a single administration at the surgical site. Clin Drug Investig 2013; 33(2): 109-15. Apseloff G, Onel E, Patou G. Time to onset of analgesia following local infiltration of liposome bupivacaine in healthy volunteers: a randomized, single-blind, sequential cohort, crossover study. Int J Clin Pharmacol Ther 2013; 51(5): 367-73. Dasta J, Ramamoorthy S, Patou G, Sinatra R. Bupivacaine liposome injectable suspension compared with bupivacaine HCl for the reduction of opioid burden in the postsurgical setting. Curr Med Res Opin 2012; 28(10): 1609-15. Haas E, Onel E, Miller H, Ragupathi M, White PF. A double-blind, randomized, active-controlled study for post-hemorrhoidectomy pain management with liposome bupivacaine, a novel local analgesic formulation. Am Surg 2012; 78(5): 574-81. Viscusi ER, Sinatra R, Onel E, Ramamoorthy SL. The safety of liposome bupivacaine, a novel local analgesic formulation. Clin J Pain 2014; 30(2): 102-10. Barrington JW, Dalury DF, Emerson RH Jr, Hawkins RJ, Joshi GP, Stulberg BN. Improving patient outcomes through advanced pain management techniques in total hip and knee arthroplasty. Am J Orthop 2013; 42(10)(Suppl. ): S1-S20. Jorfeldt L, Löfström B, Pernow B, Persson B, Wahren J, Widman B. The effect of local anaesthetics on the central circulation and respiration in man and dog. Acta Anaesthesiol Scand 1968; 12(4): 153-69. Bardsley H, Gristwood R, Baker H, Watson N, Nimmo W. A comparison of the cardiovascular effects of levobupivacaine and rac-bupivacaine following intravenous administration to healthy volunteers. Br J Clin Pharmacol 1998; 46(3): 245-9. Kharitonov V. A review of the compatibility of liposome bupivacaine with other drug products and commonly used implant materials. Postgrad Med 2014; 126(1): 129-38.